Easy Footstool Tutorial » What's Under the Needle? 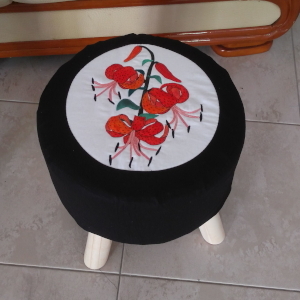 Footstools come in many different shapes and sizes. I picked up a couple of round ones which I thought were ideal for my project - a quilted footstool. One of the most important things about making these is the measuring. As long as you have the correct measurements you can make to fit or adjust to fit. For this tutorial, I'm only wanting to quilt the top of the stool. I could go on to make a quilted area around it too, but I want to use some of my flower blocks so I feel plain sides would suit these best. So where did I start? We start with the measuring. This will determine how much fabric I'll need. 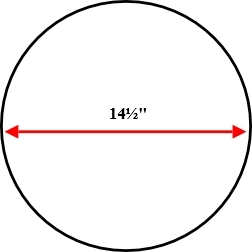 I measured the height of the side, the diameter of the top and the circumference (around it). Tip: You don't want the latter to be a tight measurement. Generally, in patchwork we allow 1/4" seam allowances but for this, I'll allow 1/2" so I have a little extra room for adjustment if I need it. I'll also need to create a casing at the bottom of the sides to pull it in at the bottom. You could simply fold it under and staple it in place however I like to be able to remove the cover for washing. 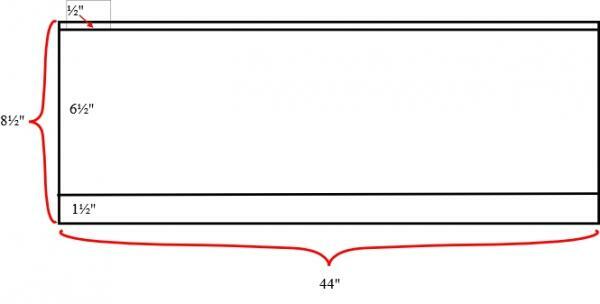 So from the measurements, I can determine the amount of fabric needed. For the circle: you can use a compass set to the radius of the circle (half the diameter) remembering to add the 1/2" seam allowance. It's definitely easier to draw on paper first. You could also draw directly from the stool however this is not as accurate. 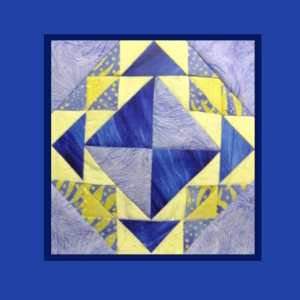 Using the template you can now create a block to fit. 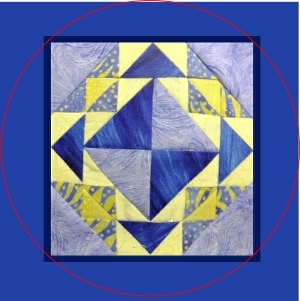 You can use any block that fits over the diameter trimming it down to the template OR you can build a block up with a border to get the right measurement. 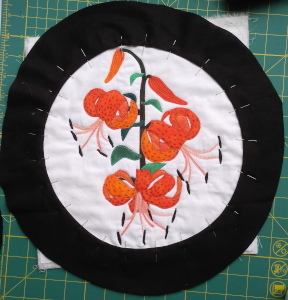 I used my flower blocks and because they were not large enough, I appliqued a border around them. 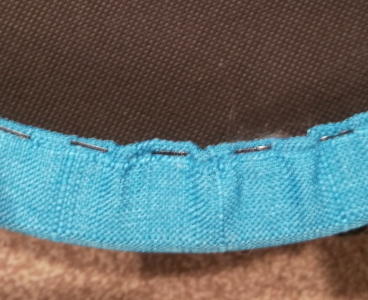 You'll want to add some batting underneath this top section to make it soft and padded. I quilted the layers together so they wouldn't move around. Check to see how many legs there are on your stool, where they are positioned and whether they are detachable. Legs positioned in from the edge are ideal as this gives you room to pull the cover underneath. Starting with the rectangle, I sewed the short ends together to make a tube.... then I tested to make sure it fitted the stool - it should be a snug fit. Much easier to make an adjustment now if needed! On the bottom end of the tube, I made a casing. I allowed 1-1/2" but you may need to adjust this depending on the amount of room you have between the edge of the stool to the legs. If you have removable legs, you can probably work without them in place (this may need some testing as mine were not removable. Make the casing by folding under slightly less than 1-1/2" (so the seam ends up on the underside of the stool) and then tuck in the raw edge pinning it in place. 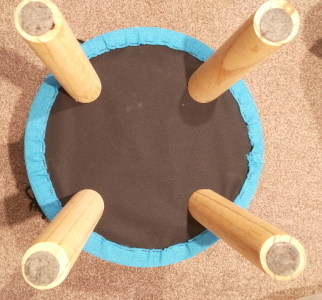 I divided the casing into quarters (because I had 4 legs) - if you have a 3-legged stool divide it into thirds - and as I sewed the casing I left about a 1" gap at each quarter mark. The gap is so the cord can be pulled out and tied in the middle between the legs. Elastic works too but I found tying a cord was the better option. To add the top, I divided the circle into quarters, marking each quarter with a pin, then did the same for the tube. I matched up the marks and raw edges together with right sides facing, then stitched the 1/2" seam with the circle on top so I could stretch the tube slightly if needed. How hard was that? Now all that is left is to thread through the tie and pop the cover on. 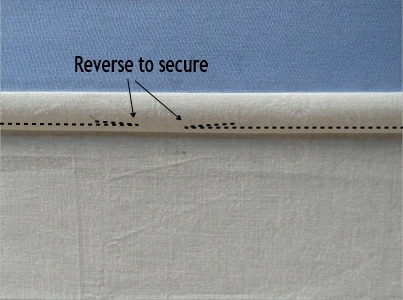 Tip: if you are using ties, make sure these are centered between the legs when you put it on because it is really hard to turn the cover once it is on.